ok i bought this 1891Mauser .243 from a friend and am trying to find out some info on it. What i have been able to find so far is that they was made with weak steel. Is this something true? i was thinking of letting my girl use it but if it dangerous then it will not get shot. Also any ideas on a value would be helpful along with any suggestions on it. action, 45,000 tops. P. O' Ackley and a few others rebarreled them in 243, and 308 back in the 60's and yes, they will take the pressure just as long as nothing goes wrong. a loose or blown primer, a incepiant head fracture, any number of things and you could wind up in a world of trouble. They don't handle loose gas as well as the 98's and a few others and they do not have the third or safety lug. With that being said, I still would have no fear shooting it all day long but would handload for it and keep all the loads down in the 42,000 lb. or so range. The 91's were very well made as far as workmanship goes, better perhaps than any military rifle before or since. About the only real drawback is the magazine, it is almost in the way dropping like it does below the stock line. There have been several conversions in years past to make a shallow box magazine out of it. Generally you get one or at the most two shells in the magazine which should prove no problem but the couple I looked at still did have feeding issues, nothing serious but with the wrong bullet shape they would jam. If someone ever works out a fool proof conversion for this, I would like to hear about it. There again, neat rifle, shoot the heck out of it but I would keep the loads in a safe range. That 1891 Mauser was manufactured in about 1892 judging from the lack of a magazine lock, plus the Ludwig Loewe company markings. It was never a suitable rifle for a high pressure cartridge like the .243 Winchester. Generally speaking it is not a desirable cartridge conversion. Value would be subjective (and low). It is not made with "weak steel". It is entirely strong and safe for the cartridge it was designed for, the 7.65x53 Mauser. The receiver/action has ZERO gas escape features. A ruptured cartridge case will most likely destroy the rifle and possibly injure the shooter and bystanders. It's just not a good rifle build by any standards. 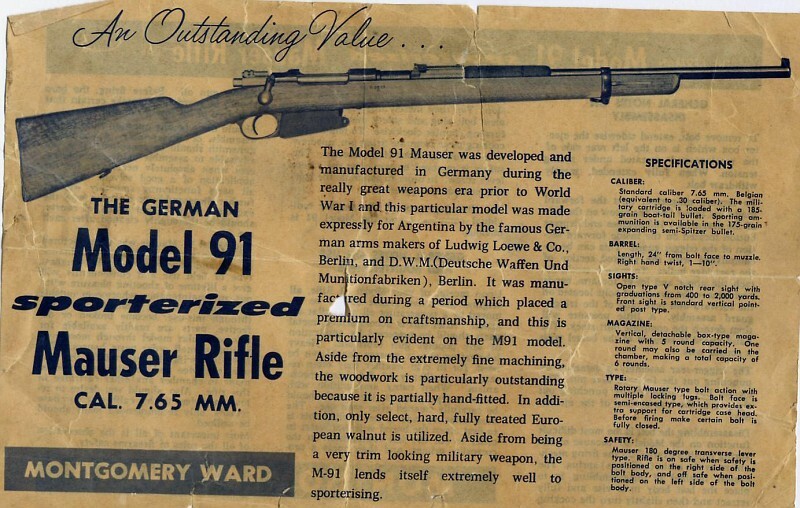 When these rifles were imported in the 1950s and 1960s all sorts of things were done to make them sell faster. Despite the high quality of the original rifle they never really brought a high price because there were so many of them. In about 2000 I paid $100 each for two of these cherry '91 long rifles. What was done to your rifle does not make it more valuable. It makes it less valuable. These rifles are now 121 years old. They have value and collectibility in their original configuration only. Very similar Swedish Experimental Trials fm/1892 rifle in 6.5x55. This rifle is worth about $3,000+. This was a commonly done chop job on 1891 Mausers, some of which were in "new" condition. Hello, camaro. Sounds like a nice cast-bullet only rifle! Those 6mm cast bullets are fun and accurate. I am shooting a 100gr. Ideal 245498 out of a Winchester-Lee straight pull sporter in 6mm Lee navy. Using IMR TrailBoss, it's like a .222 Rem. on steroids! 3/4" 50yd. groups using open buckhorn rear and German silver blade front. Thanks guys sounds like I will have to get the daughter a different rifle. I don't want to chance her picking up a factory load and blowing it up. What are you refering to on it not being able to vent gases? Between the bolt and barrel? What are you refering to on it not being able to vent gases? Between the bolt and barrel? There's much more to gas escape features than just between the bolt and barrel. To really understand it you need to study the 1898 Mauser action and compare it to all the earlier models from 1871, 1871/84, 1889, 1890, 1891, 1893, 1895 and 1896. There's an entire universe of knowledge to be gained by that study that I can't do justice to in a few lines here. Suffice to say that escaping gas can and has destroyed rifles to include shredding the stock and leaving lots of pieces of jagged steel that were once the receiver. They've killed people when the rifle grenades, blows apart because there's a massive gas leak of near 50,000 psi all at once with no place to go so things come apart. Real fast. And when it does this it's usually a couple inches in front of the shooter's face. The most common rifles to have this happen are those that have been re-purposed like your 1891 Argentine. It was modified in a way that was not something the inventor designed it to be and is now considered foolish. An accident waiting to happen, you might say. Better safe than sorry, a smart man would think. ok i'm willing to learn. can you give me a nudge in that direction? best textbook on the subject. Your rifle could be rebarreled back to the original cartridge as barrels are available from time to time. Also something like the 300 Savage would be better than the 243. If you are a handloader there is a wide range that the original cartridge can cover for different loads. I have 2 of these, the first looked very similar to the picture Dutchman posted and the second is all original. I have shot the first one enough to be on my second barrel and it was a NOS from SARCO IIRC. It has taken elk, deer, javelina, rabbits, rocks, etc. Plenty of molds are available and brass is also available or can be made from the 7 or 8X57, or 30-06 type cases. Or do as stated and keep the loads on the mold side and enjoy it. In addition to rebarreling to 300 Savage, the 35 Remington is also a excellent choice. Have used a 91 since 1962 in the original 7.65 as well as the other mentioned calibers. Killed a whole bunch of deer as well as a slew of smaller game. Good gun but you do have to keep it within its capabilities. Ever want to sell that stock,let me know. Due to "Bolt Action Rifles" by Frank de Haas there is way too much emphasis on gas handling by the different actions. If that was the only criteria to judge actions probably all but the Savage 110 would be considered too dangerous to use. The fact is many very commonly used actions have no gas handling features and no one says a word about them. It only seems to come up with pre 98 Mausers. 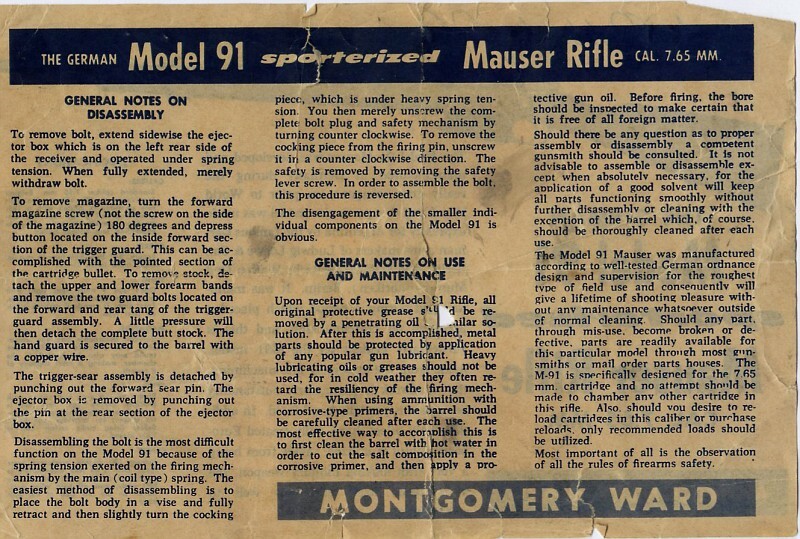 Having seen a man's face after a 98 Mauser blow up and having blown primers in a 91 Mauser myself I think the emphasis on gas handling is pretty much a technical joke. Use sane loads and good brass to keep you safe. If all the gas relief features are such a grand deal why don't people drill their bolts and actions full of holes? They don't do it because it is not really needed and it is more of a conversation issue than one of real safety. I had a blown primer on a '91/7.65mm. It blew the safety apart which became shrapnel. Otherwise the gun was ok. There was nowhere else for the escaping gas to go but out the bolt. How about rebarreling that beauty to .257 Roberts? IIRC that is a popular conversion for pre 98s. Correct me if I'm wrong, going on memory here. Otherwise, neat rifle! Love the old Mausers! [QUOTE=camaro1st;2109732]ok i bought this 1891Mauser .243 from a friend and am trying to find out some info on it. What i have been able to find so far is that they was made with weak steel. Is this something true? i was thinking of letting my girl use it but if it dangerous then it will not get shot. Pretty gun. Much of what has been said is true especially matters of gas handling. However, it does have a couple very 'modern' features: the cartridge head is completely surrounded by steel, and it also has a rotating extractor which went out of favor and now nearly every modern action (except Ruger) has the same. The head support makes failure less likely and thus more safe. Two cases of Paul Mauser being smarter than the average bear, or, if you wait long enough, what's out will be in. If it was mine, this is what I'd do: I'd modify the bolt with a gas hole in the bolt head that would line up with a hole in the left receiver ring, just like a '93 Spanish mauser. Then, I'd drill three more holes along the bolt at 45 degrees from TDC spaced along the bolt. Those three holes is how a Weatherby Vanguard handles gas. The Vanguard has a guide rib just like '93, '94 and '95 mausers do, only on the opposite side rail. Another case of Paul's genius. This would make your '91 better, IMHO, in handling gas than the '98 except for the '98's the larger flange on the bolt shroud. That's what I'd do, but I'm a little nutty. If you were to sell it, do it on GunBroker. I've seen some amazing things happen there. But the Dutchman is right, it's not worth what it might have been. dualsport, I'm interested in what exactly happened. Pardon me but I don't grasp and can't visualize what you are conveying. The safety came out of the bolt shroud? A blown primer in a Remington 700 can be very interesting too....trust me...the gun went back to the factory for a new bolt. Not saying I would put a 243 on an 1891 argy, but if I had it I would handload it down to where I felt good about it and enjoy. I also might think about stamping the barrel "6mm Pipsqueak" so that if it does fall into ignorant hands it will at least garner some attention before it is shot and maybe not with a full house 243 that way. That is a right fine looking rifle, I would be proud to have one like it. As I have a 91 in 22 varmiter (22-250) that has hadd many hundreds of rounds put down the tube in the last 40 years, I say shoot it with proper handloads and good shooting glasses. Just my view on things, take it for what it cost you. Upon firing the wing of the safety blew off and hit me in the arm. Powder and gasses escaped thru the bolt due to the pierced primer and hit me in the face. No serious harm done, but it wasn't funny either. It was a slightly bubba'd 1891 that had a nice Buehler aftermarket safety. I've shot hundreds of rounds thru it before that, both factory (Hornady) and handloads. Hunted with it too. It was a handload with a full power jacketed load. I don't really know why it happened or if I messed up. Now it wears an issue safety and is back in business but the wing won't clear a scope. My best guess is I created a headspace problem using the same brass for cast and jacketed loads unintentionally. There is no way a double charge of the slowish rifle powder could fit. so there will be less problems getting them to feed. diams are common and lots of molds and factory jbullets available. Unfortunately, rebarreling is not cheap. Bear in mind aftermarket safeties for the '91 Argie are like hen's teeth, if you want a scope mounted on the action.